The Kings beat the Lakers at home for the first time in more than three years, 100-91 on Monday night. 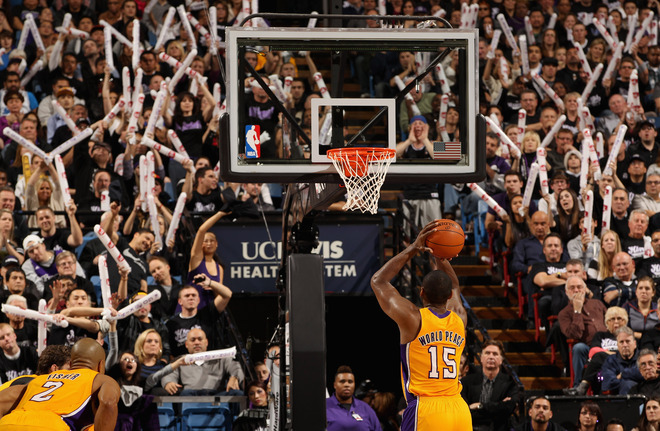 Former King Ron Artest, er, Metta World Peace wasn’t too worried about the loss. I think I’ll get a few more weeks of fun out of the “World Peace said” thing (and by “a few more weeks” I pretty much mean this post). For example, why did Artest change his name? “Changing my name was meant to inspire and bring youth together all around the world,” World Peace said in a statement released after the name change court hearing. Alrighty then. Dream big, right? At any rate, it’s a good win for the Kings and it is nice to have the distraction in town again. Might replace the “this is some cold spell we’re having, huh?” ice-breaker. Next Next post: What’s our problem?